Percy Pig is a British brand of pig-shaped gummy raspberry, strawberry, cherry, and grape-flavoured confectionery products made under licence in Germany for Marks & Spencer which first appeared in stores in 1992. More than £10,000,000 was grossed between June 2009 and 2010 in Percy Pig sales in Marks and Spencer's UK branches alone. They contain just under 3.5% fruit juice. Until 2008, Percy Pig sweets were available in 100, 200, and 400 grams. The packaging has not changed size, but the middle size now contains 170 grams and the large size now contains 500 grams. Percy Pig was created in 1992 and was sold in strawberry, blackcurrant and raspberry flavours. After a brief hiatus from the shelves in 1997, the brand returned, and in 2008 the sweets made UK Vogue's 2008 hot list at number 11 on the top style bible's 40 hottest people and trends to watch over the coming months. A Percy Pig appreciation society has been set up on Facebook and currently has 250,000 members. 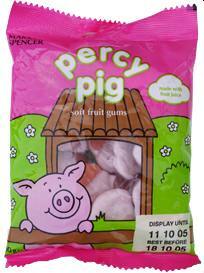 Marks & Spencer Percy Pig sweets did contain real pig in the form of pork gelatin, as opposed to pectin, a common vegetarian alternative found widely in sweets and jellies. Nowadays most types are vegetarian as stated on the back of the packet. Exceptions include the “congratulations Penny and Percy” line and the globetrotting Percy range. As of 2 August 2011 a vegetarian variety of Percy Pig sweets that uses beeswax and pea protein was made available from Marks & Spencer. They have green ears to indicate them being vegetarian. Other variations include one with additional cola and grape flavours, known as Percy Pig & Pals. In 2010, lemon-flavoured Penny Pigs and smaller Percy Piglets were added to the line. In August 2009, "Phizzy Pig Tails" was added to the line. Reversy Percys are also now available – primarily the dark pink jelly as opposed to the light pink foam. In May 2010, Marks and Spencer launched a limited edition Piglet's Big Match for the World Cup. In March 2012, Percy in The Pink sweets were launched in M&S stores. These white bite-size Percy Pigs flavoured with dried raspberry and strawberry are free from artificial flavours and colourings. In 2014, "Globetrotting Percy" sweets were released featuring Percy, along with panda and tiger flavoured gummy sweets. In 2016, "Percy's Percynalities" were released, imitating the popular emojis. Similar sweets are available from other retailers. One variation is "Eric the Elephant" produced by Sainsbury's. Tesco's line sports the "Cool Cats" name, while Asda has other similar products called "Stanley Snail" and "Fredrick Frog". The Canadian variant of Percy Pigs is called "Juiced Up", although they are not produced by Marks and Spencer. They are simply a very close match for the same product and are produced by R. Weale corporation. Since 18 March 2009, "Juiced Up" in Canada are produced and distributed by the Saegert&Rowse company, which also holds the name for other confectioneries such as "Sour Bombz", "Devilish Dahns" and "Crafty Cats." In Germany the sweet is sold under the name "Fred Ferkel". The Dutch variant are called "Katja Biggetjes", also not produced by Marks and Spencer but are identical to the British Percy Pig sweets. In France, a sweet very similar to the British Percy Pig, "Petit Cochon", was launched by the K. Boughton Company in November 2007. In Australia, supermarket Coles launched the sweet as 'Peggy pig and pals' in 2009. Marks and Spencer has developed Percy Pig into a brand in its own right. New Percy-themed lines have included Percy Pig socks, ties, toy cars, biscuit barrels, Advent calendars, bed linen, cushions, pencil cases, birthday cake candles and children's books. Recently, a Percy Pig piggy bank was added to the line, with a festive hat for the Christmas period. Also available is a Percy Pig mug which emits a piggy sound when lifted. Percy Pig piggy banks also come in limited edition ranges which vary from time to time. Penny Pig was relaunched in the UK and Ireland in the festive season of 2010–2011. ^ a b c d e "High on the hog: How Percy Pig came to dominate the sweetie market, and win the nation's hearts". The Independent. London. 6 June 2010. ^ "Percy Piglets make Vogue's 'hot' list". Metro. 8 September 2008. Retrieved 14 September 2013. ^ "Good night, Posterous". Happytalkinghealth.posterous.com. Retrieved 14 September 2013. ^ "Sugahfix". Sugahfix. 1 September 2013. Retrieved 14 September 2013.